Who: You and whomever you’d like to bring. No need to RSVP, just show up. Where: Meet 8 am at WTBOA Sales Pavilion located at the North End of the Emerald Downs Property. You can park your car there for the duration of the day. This is also where the Yearling Sale takes place and they will give a brief tour of the Sales Pavilion upon your return on the bus. When: Saturday, August 9, starts 8 am, bus will be back for the afternoon’s races. Who: Bus is full! Thank you to all that RSVP’d. The bus will be leaving Emerald Downs at 8 am. 1st Stop – Blue Ribbon Farm 9:00-9:45 am – Stallions and Broodmares will be shown. They will be seeing their offspring at the sale and at the track. 2nd Stop – Griffin Place 10:00-10:45 am – Demo on getting a sale horse to walk/stand, showing a sale horse. Bathroom facility on site. 3rd Stop – DiPietro Thoroughbreds 11:00-11:45 am – Eurocising demo. Bathing/grooming demo. Bathroom facility on site. 4th Stop – El Dorado Farms 12:00-12:45 – touch base on reading a catalog and showing them confirmation points on sale yearlings, stallions and broodmares will possible be shown, offspring will be seen at the sale and at the track. Bathroom facility on site. Then back to the track for lunch and the races. Will Brewer and Darrin Paul will be MC’ing the bus ride. Waters will be provided on the bus. Emerald Downs will be providing lunch upon your return to the track. There will be snacks (cookies, juice, coffee) at various farms throughout the morning. Dancing Yodeler didn’t disappoint today with a strong closing to finish second to the speedy War Wizard. After speaking with jockey Leslie Mawing, it turns out that Yodeler was standing awkwardly in the gate and the gate crew was trying to get him straight when they open the gates. As a result he was a little slow out of the gate and ended trailing the field in the first part. 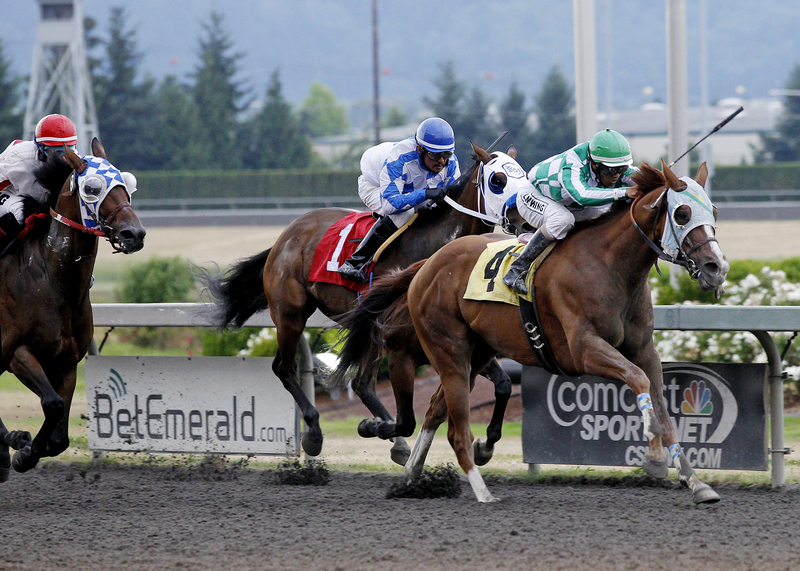 Race replays are at http://www.emeralddowns.com under Racing>Race Replays. Full Chart from Equibase is here. Please meet at the entrance to the paddock immediately after the running of the second race. Yodeler is in the third race and our Customer Service staff will meet you there. Dancing Yodeler is the “morning line” favorite for Sunday’s race. The morning line odds are not actually a handicapper’s best guess of who will win the race, but is their best guess at how the public will wager. 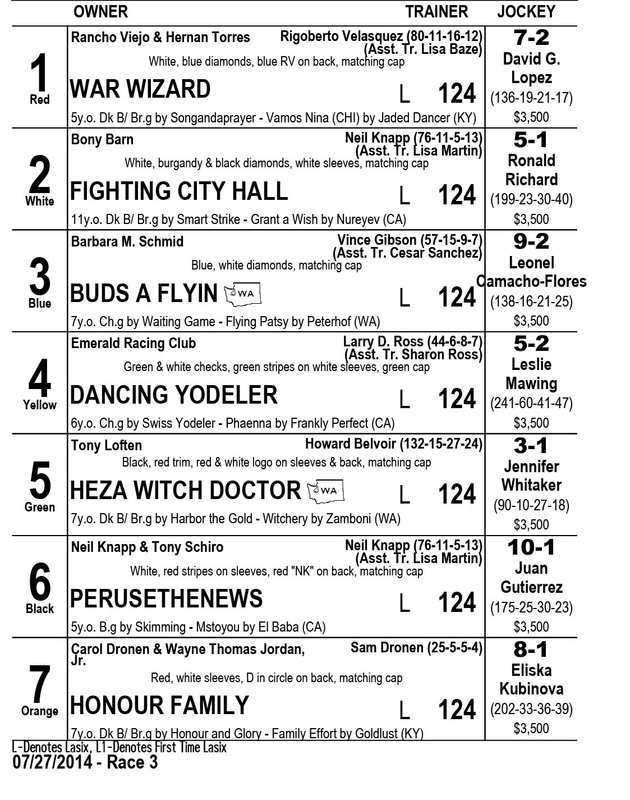 The morning line is printed in the Daily Racing Form and also in our Official Track Program. Yodeler’s “morning line” is 5-2, meaning that Rob Rao, our staff member that makes the morning line believes that he will be the favorite in his race and that his best guess at the final odds is 5-2 ($5 returned for every $2 bet). The morning line may seem simple, or in a sense a “best guess” but it is actually a mathematical formula. To explain it further, I’ve found an excerpt from Ed Burgart – race caller at Los Alamitos. His references to the takeout works for Washington as well (our Win takeout is 16.1%). While establishing the morning line looks simple on paper, it requires a mathematical formula. It isn’t as easy as putting down 5-2 on one horse and 10-1 on another. A good morning line maker wants his total odds to “balance.” If we didn’t have to worry about a takeout in the win pool (about 16 percent in California), the complete race odds would balance at 100 percent. Therefore, by adding 16 and 100 percent, we arrive at 116 percent. By allowing one point per horse, the morning line will generally balance between 124 and 126 points for fields with eight or more horses. For simplicity reasons, I try to keep my morning line odds around 125 points for nearly every race, regardless of the field size. How does an oddsmaker arrive at points for odds? And how do the odds eventually add up to 125 points? I use odds ranging from 2-5 to 30-1. In a majority of competitive races, I make the morning line favorite around 5-2 or 3-1. I always strive to find horses that I don’t think the public will like and make them longshots, in the range of 20-1 or 30-1. Then, I look for middle-range horses, the type I sense some fans will like and others won’t. These horses are usually in the 6-1 to 10-1 category. The horses I think the public will wager heaviest on are the lowest odds on the morning line. In the case of a standout horse like world champion Tailor Fit, I make his morning line odds even lower than 5-2 or 3-1, because the public is likely to wager more heavily on a proven runner. In these scenarios, the final morning line balances to 125 points. So how do we compute the odds to total 125 points? By dividing 100 percent by the odds plus 1, we arrive at a point system. For example, 2-1 represents 33 points (100 divided by two plus one). Odds of 7-2 are 22 points (100 divided by 7/2 plus 2/2 equals 100 divided by 9/2). Odds of 4-5 are 55 points (100 divided by 4/5 plus 5/5 equals 100 divided by 9/5). By reverting to grade school mathematics, we multiply 100 X 5/9 to arrive at 55 points for 4-5. And we multiply 100 X 2/9 to arrive at 22 points for 7-2. On your next trip to the track, you can determine if a morning line balances by using the point system in the accompanying box. Coincidentally, the final odds always balance around 125 points as well — use the aforementioned formulas when looking at final odds in a race chart. Using what we’ve learned above, and the point system, has our morning line odds maker hit his balance of 125 points? See if you can do the math! (The morning line is in bold above the jockey’s name). Dancing Yodeler is “back in” for Sunday, July 27. If you’ve been following along in the most recent edition of the Condition Book, book # 6, you would not see a race for him. That is because the race he entered is Xtra 7 on the overnight. These are essentially the same “conditions” as his last race. He has only won one race since April 12, 2014 making him eligible for this race. He will carry 124 lbs as an “older” horse and will run for the $3,500 claiming price over 6 1/2 furlongs. He is breaking from post 4 in a field of seven horses. Jockey Leslie Mawing is back aboard. To RSVP for paddock consideration, please click here. A reminder if you’ve already visited the paddock, do not RSVP. Tickets will be left at Will Call window under Emerald Racing Club if you plan to bring additional guests. It’s also Food Truck Day at the track Sunday, so come hungry, leave happy. We have 10+ trucks in the Park including last year’s People’s Choice Winner Evolution Revolution. The Paulick Report is an industry website that reports racing news, industry news and breeding news. It’s also a bit of a sounding board for race fans so you might get an eyeful if you read through some of the comments on particularly inciting articles. The Paulickreport.com and Bloodhorse.com are the two main horse racing news websites. Bloodhorse carried their hard copy magazine onto their web presence and Paulick Report pulls articles from multiple sources (including Bloodhorse). We will be having a Sales Seminar in the Emerald Room (4th Floor) on Saturday, August 2. Seminar will start at 1 pm. This is open to you and your family/friends that would like to attend. Will Brewer – WTBOA Vice President, Attorney. He also is the author of the Military Hawk Blog we link to from time to time. Steve Zerda – WTBOA Board member, Managing Partner – Z Thoroughbred Racing Partnerships. Saturday, August 9 we are coordinating a Sales Prep Farm Tour. This is being hosted by the WTBOA and it’s members, and they will provide bus transportation from Emerald Downs to the various farms and then return to the track in time for the day’s races. Emerald Downs will be providing box lunches for you upon your return to the track (or for those just attending the races). Space will be limited for this and I’ll coordinate an RSVP next week. Seats for the bus will be on a first come, first serve (ERC member +1). Detailed schedule will also be provided next week. After Yodeler was unsaddled at the winner’s circle, he was escorted to the test barn by two unassuming ladies in green shirts bearing the Washington Horse Racing Commission emblem. They began the chain of events that is our drug testing of every winner. The test barn is located directly across from the Quarterchute cafe. Every horse that wins a race gets tested, plus each horse that’s claimed, plus other horses selected by race stewards and some just by random tests. The top three finishers in a stakes race get tested. There can be 15 to 20 horses tested some days. The horse is escorted back to the test barn where blood is drawn and urine is collected. The samples are then split and sent to a lab for testing. The blood is the easy part. It’s drawn with a needle from the vein in the horse’s neck. But the urine isn’t exactly something you can collect without the horse’s voluntary action. In normal circumstances the horse will cool out by walking and drinking water. Then, is placed in a stall in the test barn with ample bedding where they are encouraged to pee by whistling. If the horses doesn’t show an interest in peeing, then he’s placed back on the walker for more time. As I left work after Yodeler’s race, I decided to swing by the barn to check on Yodeler. I entered the barn to a chorus of whistles echoing from his stall. This is almost two hours after the race. In his stall was the Commission vet with a sterile cup on the end of a long stick. A visual. This photo was taken in 2008. I’m afraid it’s not the most photographed job on the backstretch. Occasionally, a horse will simply refuse to go pee in the test barn. And there’s not a darn thing you can do about it except wait. And if that doesn’t work, the horse is escorted back to their stall by Commission personnel who continue to keep the horse under observation and attempt to collect a sample. Yodeler simply needed the comfort of his own stall and some peace and quiet. Shortly after my arrival he did his business and the sample was collected. The woman from the commission was none too pleased with his shyness but Yodeler seemed unperturbed at being whistled at for the past hour. Dr. Everett Macomber, commissioner for the Washington Racing Commission is preparing an article for us on race day drugs and will go into more depth on how the testing is done and what medications are permitted. You may have heard the term “conformation” many times as we refer to Yodeler or Ana. And as we move into the yearling sale, you’ll hear it even more frequently. “Conformation” simply refers to how the horse is “conformed” or built. Just like us, all horses are built differently. The reason we are so concerned with conformation is that it can ultimately affect performance and efficiency of movement. Are you pigeon-toed, splayed footed? Walk like a duck? If you have any of these conformation “faults” then you may put stress on your joints and be more prone to injury. The same applies to horses. 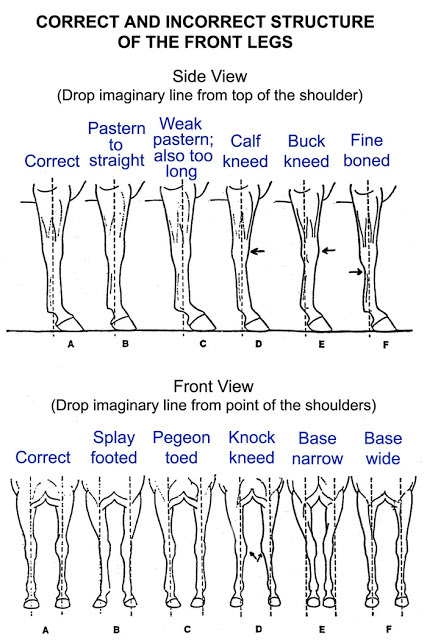 It’s not to say that a horse with one of these faults can’t be successful or fast, it just may mean that they may be more susceptible to injury because of their structure. When the “experts” talk about conformation, they are tending to compare to certain ideal standards. They are also looking for proportion and balance. Both lend themselves to performance. I’ve included some diagrams here as a reference. Forgive the spelling mistakes on the images – I pulled these from elsewhere online. 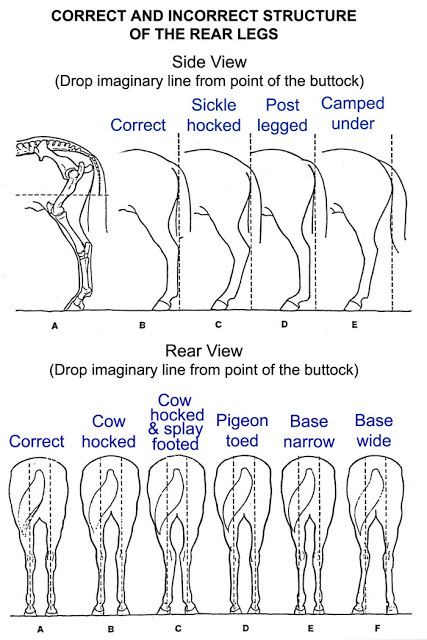 This video was produced by Purdue University students to explain conformation and is worth a watch even though it isn’t Thoroughbred specific. Good conformation is applicable for all breeds and disciplines (this video won’t display in your email, so visit http://www.emeraldracingclub.com to watch it within the blog). It is perhaps easiest to talk conformation when you are able to make comparisons. For this, see the image below and weigh in on which order you’d place them in based on their conformation! Have your favorite? Check this link for the expert’s evaluation of these three horses and see if you picked correctly! For an excellent read about Dancing Yodeler’s pedigree, visit the Military Hawk Blog. Author Will Brewer will be in attendance at our August 2 Sales Seminar event and will also make himself available at the WTBOA Yearling Sale to answer any questions. He’s an excellent resource and mentor for anyone looking to further their ownership endeavors. The “Catalog” is now available online of the horses entered in the WTBOA (Washington Thoroughbred Breeders and Owners Association) Annual Yearling Sale to be held Tuesday, August 26 at the Sales Pavilion at the North end of the Emerald Downs property. The catalog is the listing of every horse in the sale. At the Sales Seminar we will teach you how to read a catalog page and also preview it here on the blog using Anelina’s catalog page. Sales are a big part of ownership. As discussed before, you can claim a horse, purchase it privately, or buy in a sale. Over the next month, we will be delving into the sales side of things as we lead up to the yearling sale. Even if you don’t plan to buy, the Yearling Sale is a fun event to attend. There is a lot of action and it’s a great way to see a lot of horses in one place. Just don’t get too excited and throw your hand up or you might walk away with your own baby racehorse! Hip 17 (this refers to the number placed on the horse’s hip to identify it in the catalog and as it goes through the sales ring, it is a sticker that displays the number and is placed on the hip). Yearling colt by Hard Spun out of Sweet Fourty. Sold for $55,000 at last year’s yearling sale. Had it’s first start July 12 at Los Alamitos – finished 5th in a maiden special weight. Bred by Blue Ribbon Farm. Same horse as above but as a foal with it’s dam Sweet Fourty. Photo at Blue Ribbon Farm. Both horses are doing well. Ana’s abscess broke last week and is draining like cottage cheese, but it looks much better. Yodeler is in fine fettle and is back on the track jogging this week. Sharon will give him a week before she decides what race he’ll be pointed to next. A reminder to continue to follow the barn protocol with petting Ana last and not touching any of the other horses. She is still contagious. IMPORTANT: If you plan to visit the barn on Sunday, please do so before 11 am. The barn will be closed to visitors after 11 am – the Ross’ have three horses in on Sunday including Stryker Phd in the Mt. Rainier Handicap and have asked for the horses to have quiet time. A reminder for you “rail birds” that love to come out for morning training that Breakfast at the Wire continues every Saturday in July and August. The program is 8 am – 10 am and is an opportunity to get a hearty breakfast for $6 and watch the racehorses train. Just walk on in! Last week we had visits from trainers, gate crew, and more! Congratulations to the Emerald Racing Club! 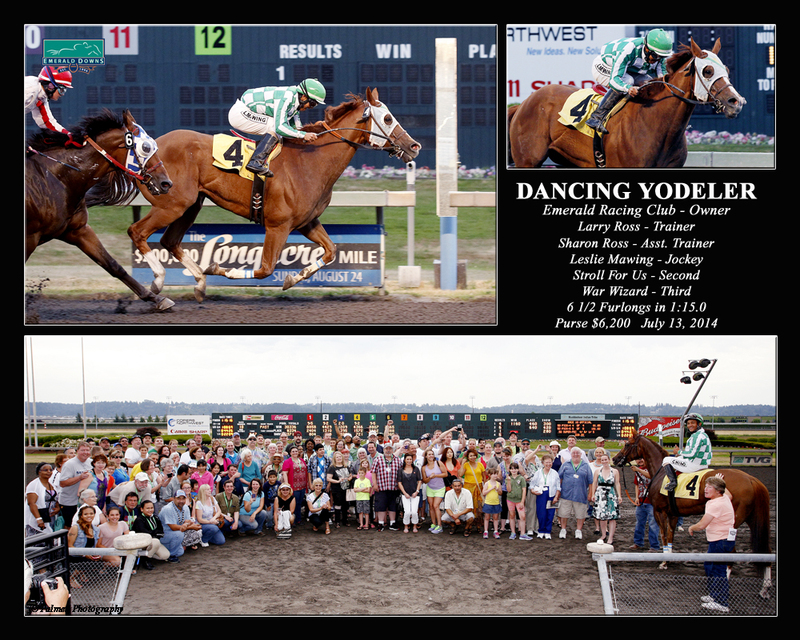 You were named Emerald Downs’ Owner of the Week for Dancing Yodeler’s win! We have a Winner’s Circle Presentation after the 5th race Saturday, July 19. If you’d like to be part of it, just come to the Winner’s Circle after the fifth race wearing your lanyard. We’ll make a quick presentation. Our owner of the week prize is dinner for four in the Redhook Turf Club and we have opted to pass this along to Yodeler’s groom. The Emerald Racing Club also made the Military Hawk blog’s top ten racing moments at Emerald Downs. You can read more from Will Brewer at his blog here. Historically, in horse racing, racehorses were owned by a single person or organization/farm. You could easily see why it was called the Sport of Kings given the costs of racehorse ownership that we’ve been reviewing monthly. 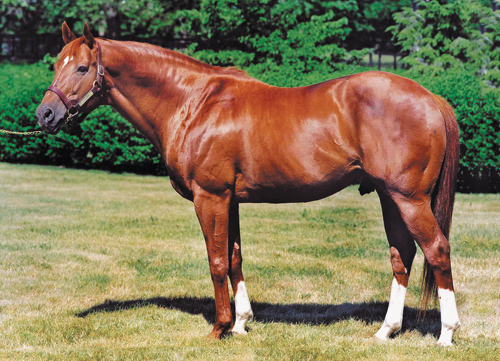 The most famous syndication was when Secretariat was retired to stud at Claiborne Farm in Kentucky. He was syndicated as a stallion for 32 shares at a total price of over $6 million dollars. We could also classify the Emerald Racing Club as a syndicate. With 128 owners, you each own 0.78% of Anelina and 0.78% of Dancing Yodeler. Syndicates evolved to spread the costs of racehorse ownership among multiple individuals. It’s a great way to “buy-in” on a racehorse without huge financial outlay and you can find the level that is appropriate for you – whether it’s 50% ownership share, or just 5% ownership share. Say for example, a group of you got together to buy a yearling. That’s a syndicate. Or one person could purchase a yearling and then seek out partners to campaign the horse – that would also be a syndicate. A syndicate or partnership would be a logical next step if you’d like to continue to dabble in racehorse ownership outside the realm of the Emerald Racing Club. For your convenience, we’ve gathered together a list of Syndicates and Partnerships that race at Emerald Downs and the contact person. This is by no means a complete list, but it is a starting point. Each syndicate is a bit different, so find the one that is right for you! Ask questions! It’s your money and you are entitled to know how it’s being spent. What percent of the horse will you own? What percent of expenses will you pay? Understand the structure – who will make the decisions regarding the horse? Is there a syndicate manager? Will the trainer make the decisions? Or will it go to the person with the majority interest in the horse? What expenses are involved, how much will you owe, and what can you earn back? What type of horse or horses do you want to own? A yearling that may take two or three years to make it to the racetrack (if it makes it)? An actively racing horse? A first time starter? Will you be able to visit your horse? Is this important to you? Where will the horses race? If it’s important to you to see your horse race in person, then a local syndicate is a good option. Some of you have indicated a desire to further your interests in racehorse ownership, be it this year or in the future. If you could email me at emeraldracingclub@gmail.com, I will begin putting you in touch with each other in case you’d like to band together to start your own partnership. I also wanted to pass along an excellent video series produced in the UK “How to Make a Racehorse.” It follows four youngsters as they develop for the races and is quite a good little online series. Keep in mind some of the terminology and methodology is a bit different in Europe versus the US. Dancing Yodeler did it! He won in breath stealing fashion. At the 1/4 pole, we all surely were rooting for him simply to get fifth. At the 1/8 pole, we would have been happy with fourth. But then suddenly, in the final 1/16th of a mile, something happened. Something in that big chestnut’s heart came to the surface and with his tongue flying, the game gelding bellied down and gave it his all. With his ears pinned he dug in, found another gear and closed between horses to find the front – and the crowd went wild! The grand experience in racehorse ownership couldn’t possibly have had a more fairy tale ending than it did today on a hot, humid day. With the slightest hint of rain threatening, our California boy got the win in the 10th and final race. It capped a fantastic day for our new jockey, Leslie Mawing (three wins including the Seattle Slew Handicap). Many thanks to trainers Larry & Sharon Ross, jockey Leslie Mawing, exercise rider Brian, and Yodeler’s groom Gumaro Martinez. It really is a team effort to get each and every horse to the races and a superb job by everyone in the Ross barn. You may order one from Reed Palmer Photography (official track photographer) for $10. This is a special promotional rate offered to Emerald Racing Club members. Email reedp@emeralddowns.com to request your photo. If you captured your own and you’d like to share, please email emeraldracingclub@gmail.com and we’ll collect them together. 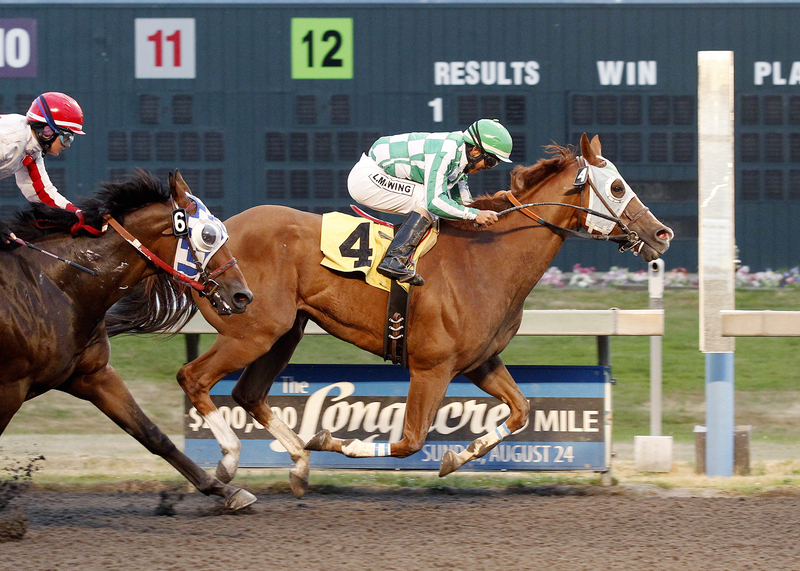 The race replay can be found at http://www.emeralddowns.com>Racing>Race Replays. DVD’s of the race are also available for $10. To order those, please just email emeraldracingclub@gmail.com and I can assist. You can read the track press release on his victory here. And Official Chart from Equibase is here. Thank you to all that attended today – and CONGRATULATIONS on your win! YOU officially broke your maiden! Please meet at the entrance to the paddock Sunday immediately after the 9th race. You’ll be escorted in by our customer service staff. Please just check in with them, because then we know if we are missing someone. Speaking of victories – if we are fortunate enough to have Yodeler’s head in front at the wire, you ALL (plus family) can come down for the Win Photo. We’ll do it old school – on the racetrack by the finish line. Customer service will be on hand to assist at the entrance gates to the winner’s circle. But as always, we hope for a safe trip and a healthy, happy horse. See you Sunday!